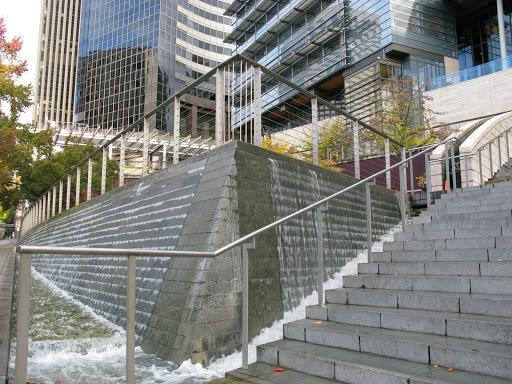 From the myriad of intersecting lines at city hall to the modern interpretation of the age-old library, Seattle has some very distinct architectural features that make walking around the city pure delight. While walking down James Street into Pioneer Square, a parking lot perched at a 45-degree angle seems to grow out of the sidewalk. Unassumingly, the entire side of a towering skyscraper on 5th Ave. is done in a simple, tiled mosaic of different colours, which you could easily miss if you weren’t paying close attention. Architectural gems, both hidden and on display, become more striking as you journey through the streets of Seattle. The central library, located at the corner of 5th and Madison is a building made almost entirely of glass, and looks more like what I imagined the recent addition to the ROM in Toronto to be (instead, they ran out of money and replaced the glass with metal). 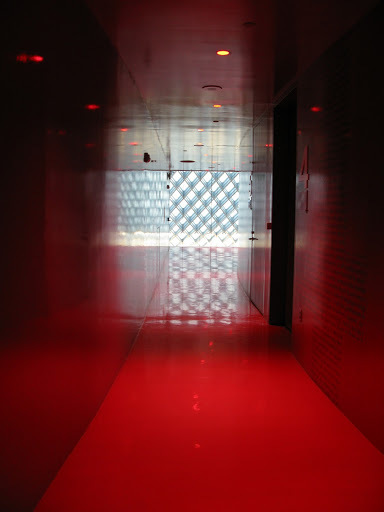 Seattle’s library was designed by Rem Koolhaas, and the Dutch influence is apparent in the library’s geometric lines and splashes of bright colour amidst an overall more neutral colour palette. There is an entire section done in the colour red: walls, ceilings, floors, staircases, doors. It is both overwhelming and awe-inspiring; it feels as though you’re travelling through a human body, all red on the inside. The escalators aren’t difficult to miss either. 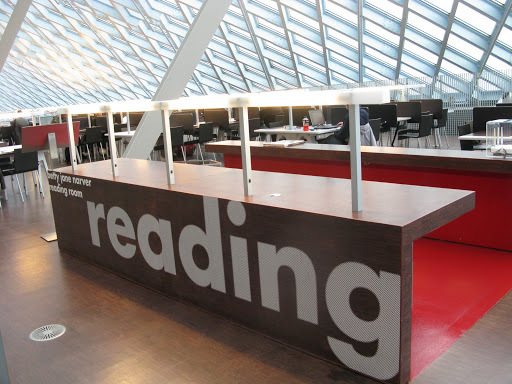 They jump out at you, illuminated and fluorescent yellow, taking you all the way up to the top floor Reading Room, which captures the essence of reading pleasure. The glass walls and ceiling provide tons of natural light, even in the Seattle gloom, and people sit in absolute silence. Surprisingly, the entire library seems extremely quiet, or perhaps the acoustics are built in such a way so as to distil noise. 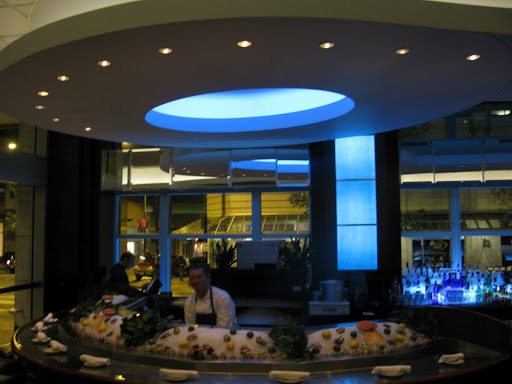 In addition to great architecture, seafood is also at a prime in Seattle. 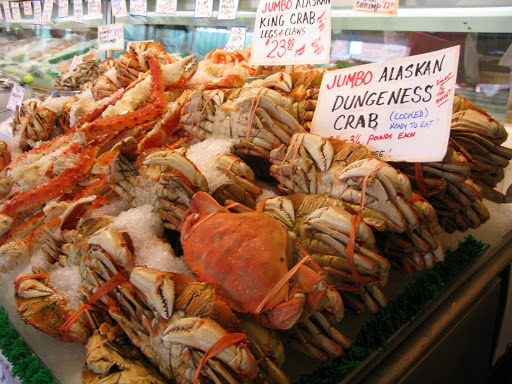 You can buy all sorts of strange, large fish with wide-eyed stares at Pike Place Market (where they throw fish just for your entertainment), not to mention piles of Dungeness crab you can eat to your heart’s content. Clam chowder is a popular staple in the market and throughout the city, and it is the perfect, hearty remedy for a cold day in the Seattle rain. If you’re looking for a more substantial meal than soup, you can head to Blueacre Seafood Restaurant located at 7th and Olive (http://blueacreseafood.com/) owned by Chef Kevin Davis and his wife Terresa, who was our hostess that evening. She was charming and personable, offering advice on what to eat and claiming “I married my husband for those crab cakes.” The service was friendly and professional overall, and the meal was truly gourmet without being overly expensive (this was in fact one of the owners’ mandates when they opened the place, and they have succeeded). Having filled up on too many carbs, I chose not to have a starter, but they brought me two complementary smoked salmon bites, which I always equate with pure class. It’s these small touches, such as lemon-infused butter for the bread and horseradish brown butter for the main, which make a meal memorable. I also liked that for many dishes, you can choose either 5 oz. or 8 oz. of fish, so you can leave room for dessert if you wish. My main consisted of parmesan crusted Alaskan halibut, which was crispy on the outside but tender on the inside, truffled parsnip puree, which tasted like a lighter and more complex version of mashed potatoes, wilted spinach, and the brown butter that garnished every bite and disappeared too quickly. Even with a bottle of wine, this meal for two was under $100, making it a top choice for a delicious and memorable dinner out. If you only have one dinner out in Seattle, make it Blueacre. Having only recently moved to the west coast, this trip to Seattle is my first. I was told it was just a smaller version of Vancouver, but it is so very different from our city across the border. 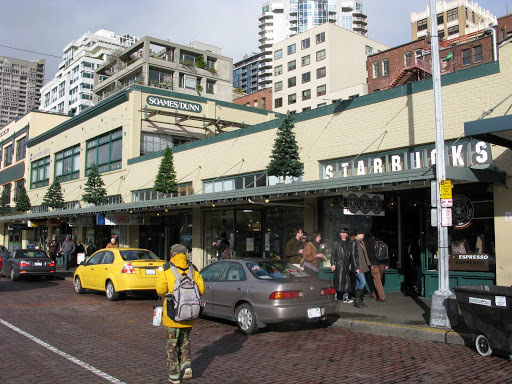 First, Seattle has a longer history than Vancouver, which means more shops, restaurants and buildings with an authentic charm from decades past. 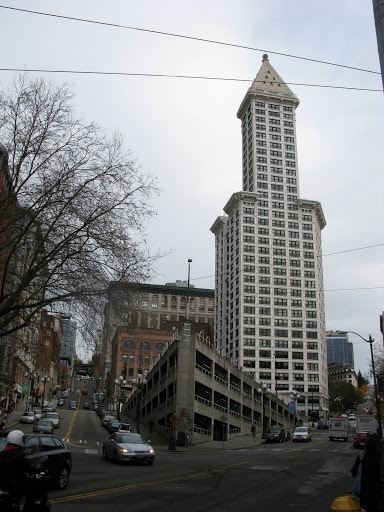 And of course, one of the most striking things about Seattle is the architecture. I think as far as a city downtown goes, Seattle is one of the finest for design. Elements of it remind me of Boston, New York and even London, likely because of the antiquated feeling to places such as Pioneer Square. 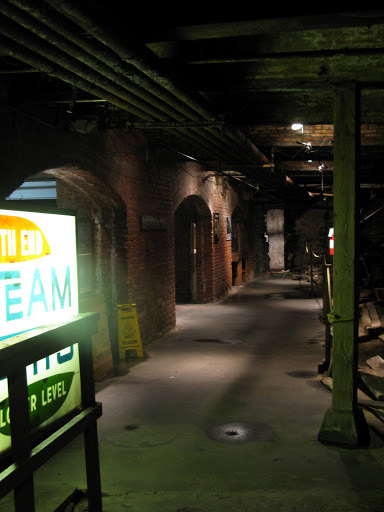 On Bill Speidel’s Underground Tour, we learned that Seattle was established in the 1850s, when settlers from out east courageously ventured west to start a new town in which to turn a profit. Its first industry was lumber, but coal and gold also became important resources before the 1900s. The tour is underground because the current city is built above the old town. After a series of city planning blunders, including building on piles of sawdust landfill and constructing 10-35 ft. town walls to help with the gravity flow of sewage disposal and to avoid high tide, the streets were covered with bricks reinforced in the shape of Roman arches. This project was inspired by the need for safety in the streets: several people fell to their deaths off the town walls, while others had heavy objects, such as cast iron stoves, fall on them from the ledge above. It was an informative and entertaining tour with guide Rick, and I would recommend it to anyone who visits Seattle. The tour is 90 minutes in length and the cost is $15. Next thing on my list is coffee. Coffee is good in Seattle, and probably keeps much of the population not only caffeinated but in the green, as it is so readily available. No doubt, we went to the first-ever Starbuck’s store near Pike Place Market (http://www.pikeplacemarket.org/), shedding light on their popular brew called “Pike Place”. It was decent coffee, but it definitely wasn’t my top cup this trip. We enjoyed a great local brew at Melrose Market’s (http://melrosemarketseattle.com/) Homegrown Sustainable Sandwich Shop located on Capitol Hill. Also worth mentioning is their breakfast sandwich made with local ingredients and packed with flavour. The sandwich comes with a semi-runny egg topped with cheese and avocado on a massive sesame bun, with a side of warm oatmeal. At $6 this is a top economical choice for a hearty and healthy breakfast. Finally, my best coffee in Seattle was at The Cherry Street Coffee House (http://cherryst.com/) near Pioneer Square, the original site and namesake of the café, which has now spread out to four other locales in the city because of its popularity. 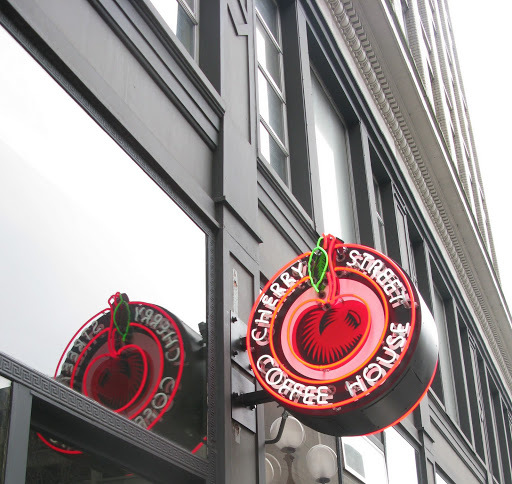 We were drawn to the place because of the funky neon sign (of which there are many in Seattle, giving it an authentic 1950s vibe), and were pleasantly surprised by the high quality of the food and the complex, but smooth taste of the coffee. I enjoyed a delicious lox and cream cheese bagel, with a side of tomato ginger soup. If you’re looking for a quick, affordable lunch in a comfortable setting, The Cherry Street Coffee House is a fantastic bet. 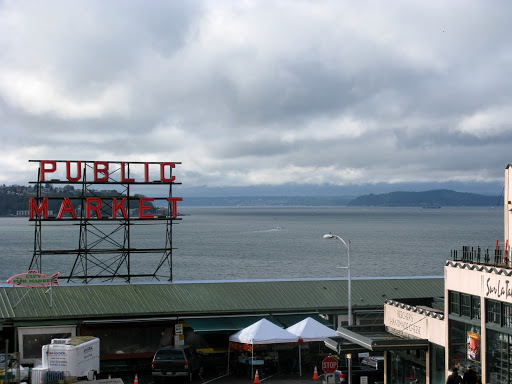 Stay tuned for more Seattle highlights, including architecture and seafood in my next blog post! The engagement of Prince William to Kate Middleton was officially announced today, and the media is having a field day. This comes as no surprise considering the Royal Family’s celebrity status both in England and the Commonwealth. Yet, for a Canadian citizen whose royal knowledge is almost non-existent, I was curious to know exactly what it is that makes this event so noteworthy. So what do we know? We know they are engaged. We know they are to be married sometime next year. And we know that her engagement ring was Princess Diana’s. We are also well aware of the legacy left behind by Diana, and that her divorce may have been one of the factors leading to Prince William waiting so long to propose. He also said in an interview that he wanted to give Kate plenty of time to “back out”. Although it was said partly in jest, William is no stranger to the attention of the media, and is genuinely concerned for the well-being of his future wife. After all, the constant media attention was one of the things Diana found so difficult about being part of the royal family. Canadian news sources seem to be focusing on the “Royal Romance” aspect of the engagement, noting that instead of the traditional courtship that precedes royal marriages, William and Kate met conventionally, having gone to university together. It is a modern relationship that took over eight years and a few bumps in the road to reach the engagement. For the first time, the royal couple feels within close reach of the public; they appear to have gone through what many couples go through before they tie the knot. Furthermore, Kate comes from a middle-class family who became self-made millionaires rather than being of royal descent. She is the girl next door and she is on her way to becoming not only a princess, but the Queen of England. For many people, particularly the British, this wedding celebration will be an opportunity for national unity and a way of bringing people together. It is joyous occasion that will be shared in a very public fashion, unlike most celebrity weddings that are done more clandestinely. It is expected that more than 3 billion will watch the event worldwide. Although I never gave the royal family much thought, the media attention speaks to their popularity, and I look forward to learning more about William and Kate, who promise to be a power-couple like we’ve never seen before from the royal family tree. Eating on the go can be challenging, especially if you lead a healthy lifestyle. The easiest thing for me has always been Subway, a quick service restaurant built on the little-known mandate at the time (in Canada they opened in the glorious 80s) of fresh ingredients. Now, after years of eating there and after a few so-called sandwich “artists” have ruined my veggie patty, it’s time for a change. A niche market for Mexican food lovers has recently emerged in Canada, where burrito eating has become a bit of a sensation. In the GTA we have places like Big Fat Burrito in Kensington Market and a number of Burrito Boys in the areas of Port Credit and downtown Toronto, to name a few. They represent a revolution of healthy-minded individuals who love the fresh ingredients and spicy flavours of Mexican food, but have been searching for something better than the sad tortillas from Taco Bell. 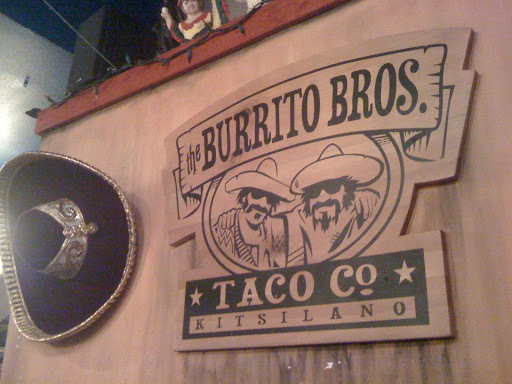 On the west coast of Vancouver, healthier options include Burrito Bros. Taco Company in Kitsilano. They make all of their food in-house, and their ingredients come in fresh on a daily basis. Homemade tortilla chips and salsa, both roja (red) and verde (green) are included with every meal, a crispy complement to the juicy burritos. Each one is packed to the brim with veggies, rice and beans, and your choice of protein: beef, chicken or Baja fish. Impressively, they even have veggie “ground round”, a simulated ground meat that most vegetarians are familiar with, but something I have never seen on any restaurant menu. All of these fresh ingredients are topped with zesty pico de gallo, and burrito sauce, but you can also add your own heat with a variety of hot sauces that are the real Mexican deal. This place is excellent if you’re on a budget, since most of the dishes range from $7-8, and you can get Red Truck on draft for $4.50 and double Margaritas for $6.25. I think you’d be hard-pressed to find a 2 oz. drink anywhere in the city at this price! The atmosphere is casual but colourful in its vibrant Mexican décor, and the wait time for your food is usually only 10 minutes, depending on how busy it is. When the weather permits, they have a great sun-facing patio: a perfect place to enjoy a Corona or Pacifico while chomping down on a spicy burrito. One of the most impressive things about Burrito Bros. is that they have a Buy 10 Get 1 Free card! They even keep it on file for you (don’t worry, it won’t be too hard to find as they are organized by letter and gender). I haven’t seen something like that on offer since the days of Subway stamps, which was discontinued with no clear explanation. I mean, if privately-owned Burrito Bros. can do it, why can’t they?